You’ve got your ping pong table, your paddles, and even a group to play with. The only missing element is the ball. This is likely the most disposable part of your ping pong game and will need to be replaced fairly regularly. The options vary widely and it can be a little confusing to sift through everything. Ping pong balls also tend to be used for more than just ping pong – which further increases your options; at least on the lower quality end of things. Whatever your purpose in buying a ping pong ball, there is a right one for you. If you want to play at a high level, you’ll pay a little more for a competition-ready ball but it will be worth it. There are also decent practice ones available that won’t break the bank quite as much and will bother you less when they get crushed or lost. However; if your purposes are for beer pong, carnival games, various crafts, or pet toys you are likely well served with a little lower quality ball as bounce and consistency probably doesn’t matter nearly as much and you can get great options there for very cheap. Let’s go over the best in all of those categories. 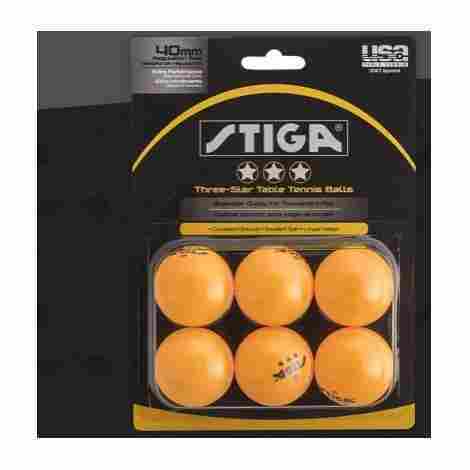 These STIGA 3 star table tennis balls are very high quality. They are sized and weighted exactly to tournament specs and that is consistent through all the balls. They come in white or orange so you can choose the color that best suits you. These celluloid balls offer superior spin, bounce, and control. Because they are celluloid, they spin differently than a standard plastic ball would. 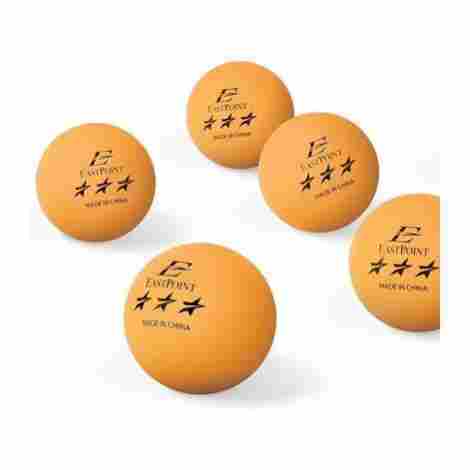 They are of a much higher quality than a standard ping pong ball and will up the level of your game. If you are looking for a ball that is exactly like that you would use in a tournament, then these are your ball. They weigh 2.7 grams and are 40 mm which makes them ITTF regulation approved. They are also USA table tennis approved. These are really high-quality ping pong balls. They are made by STIGA which is also a leader in making ping pong tables. They know table tennis and make good products. You get 6 of them in a pack and they are actually surprisingly inexpensive for the quality. If you are looking for a ball with solid construction, then this is definitely a good, affordable option. This ping pong ball is regulation size and weight and get a good bounce. 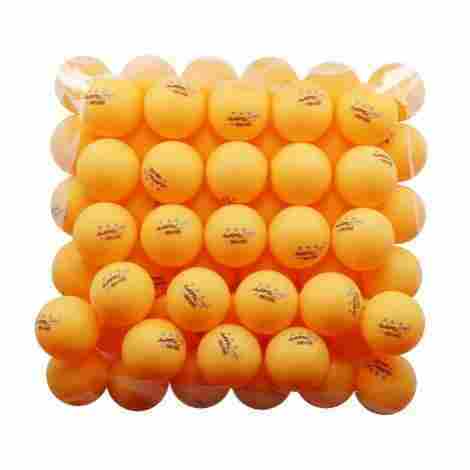 They come in white or orange and in a large value pack of 50 balls. They are long lasting and run through a number of quality tests before they ever leave the manufacturer in China. Because these balls are so affordable they can easily be used for many purposes. They are weighted and sized appropriately to be used for actually playing ping pong or table tennis, but also function well for practice, training, for use in table tennis robots, and can be used for school events, for beginners and pros alike. 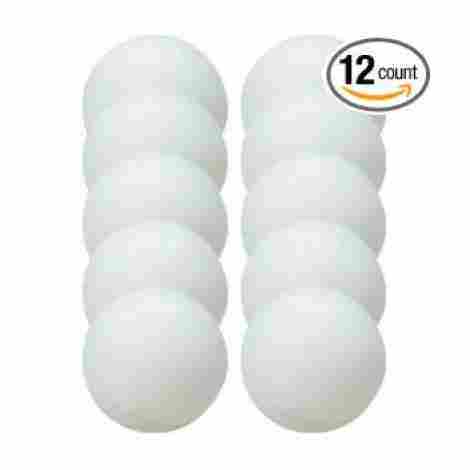 If you are looking to buy a large amount of ping pong balls for not a large amount of money then this is absolutely one of your best options. They come in a pack of 50 for almost as much as you’ll pay for a pack of 6 or 12 for other brands on the list. You are getting a lot of bang for your buck here and will be very pleased with this purchase. 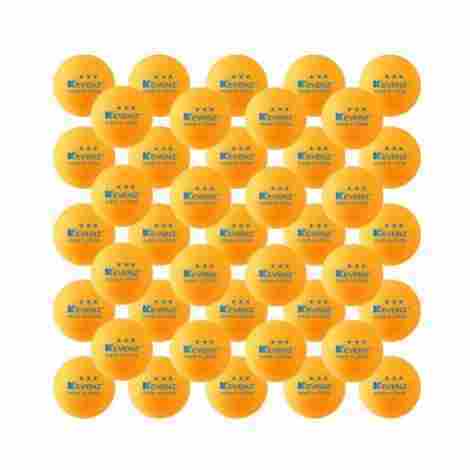 This 50 pack of Mapol ping pong balls is bright orange and make perfect training balls. They are not 3 star quality, nor are they meant to be. They are perfect for training, kids, or for use in the stadium or club. Since they come in a pack of 50 you won’t worry about losing one or two every now and then and they even come with a 30 day guarantee. This ping pong ball is built to last. It is just a little heavier, falling between 2.7-2.85 gram range, and just a little bit bigger at 40.1-40.25 mm than a regulation size ball. However; this means that it will be a little easier to hit and control and is great for practicing and really starting to master the sport. You will be able to get magnificent control with these balls. They have a matte surface which helps to make them a little stickier, and with the above mentioned weight and size, they aren’t as likely to bounce around or out of control as other balls. They also won’t go as fast which further helps to control them. This is a value pack purchase of ping pong balls. Like most value purchases, you get a lot more for your money when you buy a lot more. You will get 50 balls for the price of 6 or less of other brands. This is definitely a good buy that you will be pleased with. These ping pong balls have an unusual name, or do they? There is a good chance that many ping pong ball purchases are actually used for Beer Pong and there’s no beating around the main purpose for these balls. However; they are still very functional for anything else you may want to use ping pong balls for, except maybe actual ping pong tournaments; though they are great for practice and casual play. These balls are made with a special “white” surface that is meant to resist any adherence. That means that there will be no dust or lint or wordage to get in the way of your perfect bounce. This also makes it perfect for use in crafts or other projects. It is important to note that they come in either white or a variety pack of colors - both of which have a nice smooth surface. These balls have good bounce and size and can be used for any number of reasons. Beer Pong, ahem, is obviously their intended purpose but they also work well for any other type of pong as well - actual ping pong or table tennis (but only for training or practicing purposes! ), carnival games, ball bounce games, or for cat toys. This is probably the cheapest pack of balls you can buy. 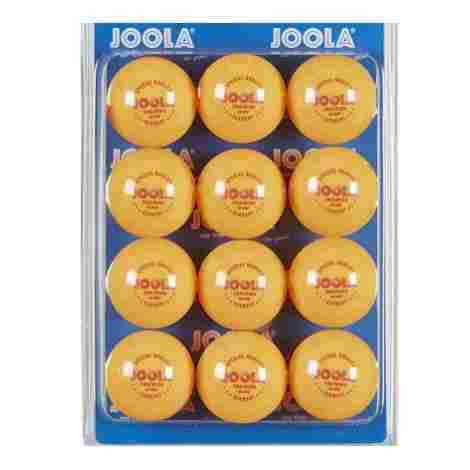 They are of a lesser quality than a standard sized ping pong ball, but if you are looking for ping pong balls for any other reason than competitive ping pong or table tennis, then this is the best buy you can get. JOOLA is one of the best makers of ping pong tables so it only makes sense that they would make a quality ball to use on that table and this is that ball. They are 3 star, which means they are great for competitive play, but can also be used for practice and training or whatever else you want to use them for. These balls come in packs of orange or packs of white so you can get one or the other or both! Both colors are made of high-quality celluloid material and are built to last. The colors are vibrant and easy to track along the table or floor or wherever they end up. These balls are ready to play in competition. They are of the right size, 40 mm, and high enough quality for even the most competitive players to enjoy hitting back and forth. They are also 3 star balls which is further evidence to their readiness for serious play. This is not a value pack of ping pong balls like the last few we have discussed, but compared to other serious ping pong brand balls, these are very well priced. You get a decent amount of balls for a decent price and will be satisfied with your purchase. This Ping Pong ball is one of the leading balls in the industry. It is made of poly plastic rather than celluloid and is seemingly indestructible because of it. It is 3 star, so ready for competitive play or simply to be used in training or practice. This is the ping pong ball for serious players or those striving to be. These are made of a poly plastic material which is actually safer and more durable than the celluloid which used to be the industry standard for ping pong balls. They are also seamless which makes for great, uninterrupted play with nice and predictable bounce. This ball is one of the best on the market. It offers revolutionary material and construction that has seriously upped the table tennis market. It is approved for use in both domestic and international competitions. Practicing with the ball you will use in competition will seriously improve your chances of success. This ball is fairly expensive comparatively. However; it makes up for its high cost in the quality it provides. It will last a long time and will easily outlast the life of several of the cheaper balls. It will maintain it’s quality throughout its life as well. If you are serious about your ping pong and want a ball similar to identical to that you will use in competition, spending a little more here won’t be an issue at all. These EastPoint Table Tennis Balls come exactly as you want them to. They come in orange or white, 1 star or 3 star. All varieties are cost effective and official regulation size and weight. They are engineered for precision and all varieties are great for training, while the 3 star are ready to go in competition. Each ball that EastPoint makes is engineered for precision, accuracy, roundness, rebound, and weight. What that means for you is that when you hit the ball, you can reasonably control it and know that there are not any dents or weak spots that will ruin your bounce when you need it to be accurate. These balls are great for any situation. They are of consistently high quality and can easily be used for tournament play. If you’re looking for more of a practice ball, they are great for that as well and cheap enough that you won’t stress out if one breaks or gets lost. If you are someone who likes to practice with the same ball they use in competition, then these are a great option. For tournament ready balls, these come at a very inexpensive price. They fall among the cheapest that are made to use in tournaments as well as practice. You won’t worry about losing or stepping on one, but will be able to know you can rely on it when you need it most. Overall, this is a purchase you will be satisfied with. This is a quality ball that you will have for a long time. They are only 1 star so they are meant for practice and more casual play than a competition ready 3 star ball. They are also great for any other ping pong ball uses - ahem, beer pong, or pet toys. 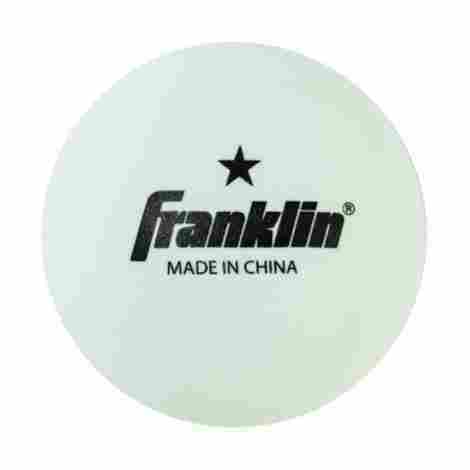 These Franklin 1 star balls are built for performance. 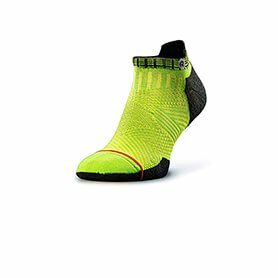 They are hearty and durable and will hold up to a lot of abuse. You will get increased control with a more consistent bounce than you will with many other balls. They are the perfect ball for practice and casual play. They are great for anyone - from kids to table tennis masters. These ping pong balls are the official weight, 2.6-2.9 grams, and size, 40 mm. This makes them the perfect practice ball because they feel and function like a 3-star ball would but come at a 1-star ball price. You’ll be ready for competition after training and mastering your game with these. The price tag on these balls is just what you want to see. You’ll spend a reasonable amount for a good package of balls that will last you for a long time. Each ball is built to last and made to feel like a competition ball, but comes at a much smaller price than other balls with the same look and feel. You will be very pleased with this purchase. Often times you want ping pong balls for a purpose other than just ping pong. These may be the balls for you. 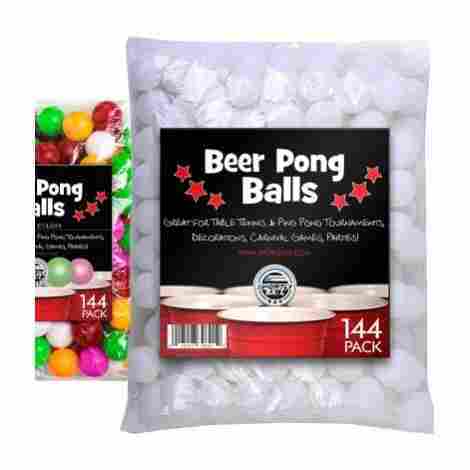 As Beer Pong is in the name, they are great for that, but they can also be used to play carnival games, for pet toys, and are easily used to play ping pong or table tennis, though they don’t carry any sort of rating when compared to 1 or 3 star balls found elsewhere. These are very generic balls. They are made of plastic and come with no grade. They are white with no writing or anything else on the surface. This may seem like a turn off initially, but if you are looking for a blank white ball then this is a perfect option. They are also cheap enough that you won’t feel bad losing any when that inevitably happens. These balls are just a little bit smaller than the standard sized ping pong ball. This is often a good thing, especially if you aren’t a competitive ping pong player. Smaller balls will fit into robot table machines easily, zip around a little faster if that’s more your style, and as mentioned above, are great for all sorts of other games. This package of balls is very cost effective. Even better, it is cost effective at a normal size - meaning you don’t have to buy 50 balls in order to get a good price. If you’re looking for just a dozen balls, don’t want to get something super fancy, but still want a functional, working ping pong ball then this is your ball. 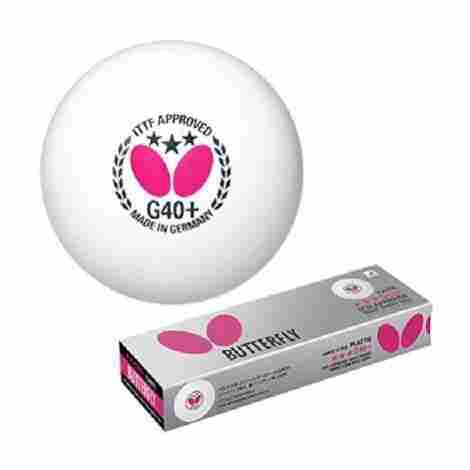 Made in Germany, these Butterfly balls are the official ball of the Canada Butterfly Cup as well as the official ball in Butterfly sponsored tournaments in North America. They are a professional ball which means they are regulation size and weight. They are approved by ITTF and USTTA for tournament play at the top level. If you want a good ball, this is it. This is a newer age ping pong ball that is made of poly plastic instead of celluloid. It is still seamless and is likely as close as you’ll get to the feel and bounce of the more traditional material. It is reasonably easy to control and the bounce is consistent thanks to the consistent thickness of the walls. This table tennis ball is available in various sizing options. This is great because it is a nice enough ball that you are paying for its quality and you want to be able to decide if you want 3 or 12 balls. You likely won’t need to get them in bulk as you would a practice ball as they are meant to be used in tournament play. As is often true in life, you get what you pay for. Here you will pay a pretty penny, but you will also get a high-quality product. This is the most expensive on our list but is also one of the most highly rated. It is the official balls of numerous tournaments and is approved by more than one organization for tournament play. You don’t get a ball like that for cheap. Now we’ve talked about some of the best but how do you know which one to buy? Ping pong balls can be used for so many different tasks and there are several things to consider, especially because the price can vary so much depending on the type of ball you get and spending more money than you need to is never a good thing. Nor is buying something lower than the expected quality. You want to get a ball that matches your needs and is perfect for you! Before you go to make a purchase you will need to know what you want to use the ping pong ball for – whether actual table tennis, beer pong, or a pet toy. You’ll also want to have an idea of the size you want, the color you want, and whether you want to play competitively or just for fun. Knowing these things will really help you get the right ball for your situation. Let’s further discuss these criteria. One of the very first things that you need to understand when going to buy ping pong balls is the star rating. Most balls will have 1-3 stars on them and that is for more than just design. This helps you to better understand the quality and intended use of the ball. 1 star balls are typically designed to be used in practice. They are cheaper and of a slightly lesser quality than three star balls, though can still be very good. You can generally buy them in bulk and won’t be too upset if one gets lost or broken because they are pretty easy to replace. 3 star balls are meant to be used in competition. They are of the highest quality and their price reflects that. You get far less 3 star balls at a lower price point than you do 1 star balls. As such, they are generally saved for matches and competition. The good news here is that if you’ve been practicing on a 1-star ball, your ability to play well on a 3-star ball will be much greater as they tend to be easier to control, have a better bounce, and go off of the racquet a little more smoothly. You will find some balls that are unrated. This means that they aren’t specifically designed to be used in official ping pong use, but may be meant for carnival games, arts, and crafts, etc. They can be used to play ping pong, but their quality for bounce and moving through the air isn’t as great as you would even find on a 1-star ball. It should be noted that any ball used in an official competition has to be approved by that organization. Simply having a 3-star rating isn’t good enough. The star system is based on general rules and may vary according to manufacturer. 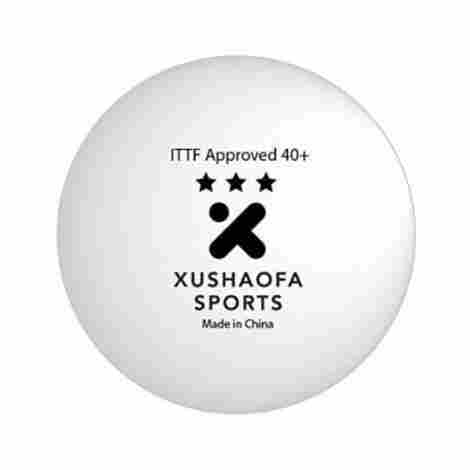 Balls used in official competition play are approved by ITTF. There are a wide variety of things that people need small white balls for. Obviously, they are used and typically manufactured for ping pong or table tennis, but that isn’t always the case and the ball you choose to buy may vary based on what you want to use it for. If you want to play high-level ping pong, then you’ll want a ball that can support that. It should be made by a company that has a good reputation as far as ping pong goes. It should have at least 1 star and preferably 3 stars if you plan on competing at all. They’ll be more expensive, but the added cost will also make them a more balanced ball that is more easily controlled. If you are more of the beer pong variety, you still need a ping pong ball but will be perfectly happy with a 38 mm one, or maybe want to get multi-colored ones. Either way, it doesn’t have to be as high of quality, though you still do want it to bounce well. The same goes for other carnival games or any other variety of “pong” you may be playing. Lastly, there are other uses – such as crafts or pet toys – that don’t require a fancy ball at all. Here you want something that is a plain white surface, or perhaps another solid color. You can buy ones like this in bulk and for relatively cheap. In summary, your intended purpose will really determine the type of ball you buy. You will be sorely disappointed with a ball meant for crafting if you are playing ping pong. And vice versa – you will be spending way more money than you need to for crafts if you buy a 3 star rated ping pong ball. Know what your need is, and buy a ball to match that. After the 2000 Olympics in Sydney, the official ball size for Ping Pong was changed from 38 mm to 40 mm. This does, in fact, affect how the game is played and makes a significant difference in how fast it goes. A 38 mm ball will fly and go so fast that it’s hard to keep track of if you are an observer. While you can still get great bounce and spin on a 40 mm ball, it does slow the game down. Despite the fact that the official size is now 40 mm, you can still very easily find 38 mm balls and there are multiple balls on this list that are 38 mm. For some the smaller size may be preferred because it does go faster or works better for the particular task they are trying to accomplish. Anything that is rated with even 1 star will be official regulation size. This is important if you are wanting to play competitive ping pong or table tennis. It would be a great disservice to routinely practice with a smaller ball when the bounce can be drastically different. If your intent is to play competitively, then you absolutely need to have a 40 mm size. Ping pong balls typically come in either white or orange. This is because those are the best colors to contrast with the table itself. A white ball may not stand out great against a gray board, but an orange one would. Whereas, white would contrast nicely against a dark blue table top. If you want to go into the realm of other colors, then you can absolutely find them. They will typically be the nonrated variety which means they are cheaper and of a slightly lower quality as far as bounce and spin goes – which may or may not be important depending on your end goal. Q: What material is this ball made out of? A: The standard for Ping Pong Balls used to be Celluloid and as such, many are still made of celluloid. However; it can be somewhat toxic to produce and the industry is moving towards a poly plastic material that functions very nearly to how celluloid does. The shift is towards this, and many companies already use poly plastic. Q: What is inside of a Ping Pong Ball? A: This one may seems obvious, but it’s worth asking. The answer? Air! Q: Are these ping pong balls seamless? A: Quality ping pong balls are seamless. Many are not, but if you are using it for anything other than playing actual ping pong or table tennis, then it doesn’t matter too much. Q: What is the regulation size for Ping Pong Balls? Q: Can these be used in a robot table tennis machine? A: Most can, though the more perfectly round the better otherwise they tend to get stuck more easily. Q: Are these good for beer pong? A: Any ping pong ball can be used for beer pong. A beer pong ball doesn’t have to be as high quality as a game ready ping pong ball though, so feel free to buy cheaper packs that come in bulk.